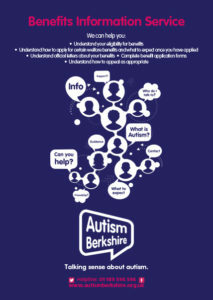 Autism Berkshire’s Benefits Advice Service is available to people living with autism in the county, whether or not they are members of Autism Berkshire. Kevin Jackson, our highly-qualified Benefits Adviser, has many years of experience working in the fields of autism and benefits/access to work. 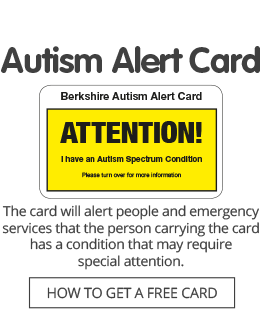 He can help autistic adults and parents and carers of children with autism spectrum conditions. Support is also available to people with related conditions including severe dyslexia, dyspraxia, obsessive compulsive disorder (OCD) and attention deficit hyperactivity disorder (ADHD), subject to payment of a fee. He is also able to assist with appeals against decisions made under the Department for Work and Pensions assessment process and to represent people at benefit assessment hearings and appeal tribunals. Kevin is available for one-to-one daytime appointments booked in advance at our office in Reading on Mondays and at the Shelter office, at 27 Church Street, Slough, SL1 1PL, on Fridays. Please note that appointments in Slough are only available to residents of the Borough of Slough, as part of the SPACE project, led by Slough Council for Voluntary Services. Due to high levels of demand for support with benefits applications and appeals, we are revising the way we operate the service to better reflect the workload involved in particular cases. Advice will be available free of charge at daytime appointments in Reading and Slough for new clients who need help completing initial application forms for benefits and for existing clients who need support with mandatory reconsiderations of applications and appeals to tribunals. Please note that we strongly advise people to contact us when they start to prepare to make a benefit application, so that Kevin can ensure the forms contain as much relevant information as possible for the initial assessment by the Department for Work and Pensions. Reading (all Mondays): April 15, April 29, May 13, May 20, June 3, June 10, June 24. Slough (Fridays unless stated): Thursday April 18, May 3, May 10, May 17, May 24, May 31, June 14, June 28. People who have made initial applications themselves, then contact us for help with mandatory reconsiderations or appeals to tribunals will be asked to pay a fee of £40 for advice. Reading (on Mondays unless stated): Contact the office for details. Advice on benefit claims involving people with severe dyslexia, dyspraxia, OCD and ADHD is also available for a fee of £60 per appointment. Kevin is also available for advice appointments in the evening at our office in Reading and to represent people in person at PIP and Universal Credit assessment hearings and tribunals. All these services are subject to a fee of £40 per meeting or hearing, plus travel expenses for hearings and tribunals. Click here to download our Benefits Service leaflet.